The Pug is a true people dog. Bred by the ancient Chinese as a lap dog, the Pug is a loveable, affectionate, characterful little dog who craves its owner’s company. Treated with kindness, respect and affection, there are few dogs that can match the Pug as a companion dog. The Pug is a sociable little dog. 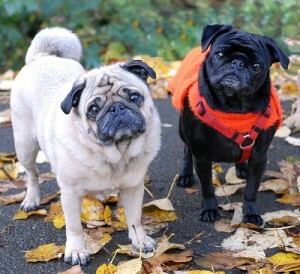 Pugs are friendly and playful, excellent with other animals and children but sensitive at the same time. While their somewhat stern appearance belies their true cheerful personality, they are not a dog best suited to a noisy environment. While they may have the reputation for being a little wilful, they are not a disobedient dog. It’s simply their aristocratic upbringing! A tough little dog who enjoys a rough and tumble as much as any dog, the Pug’s prominent eyes make them highly susceptible to injury. Though they love to play, care must be taken in this regard. The Pug makes an excellent companion dog. While they will bark when necessary, their bark is definitely worse than their bite. Having alerted their owner to the presence of a stranger or an unusual noise, any stranger is ensured a friendly welcome. In summary then, there are few more ideal companion dogs than the Pug. The Pug is particularly suited to the quieter, older owner, although just as happy with a family mindful of the Pugs needs. They love people and crave nothing more from their owner than their companionship.